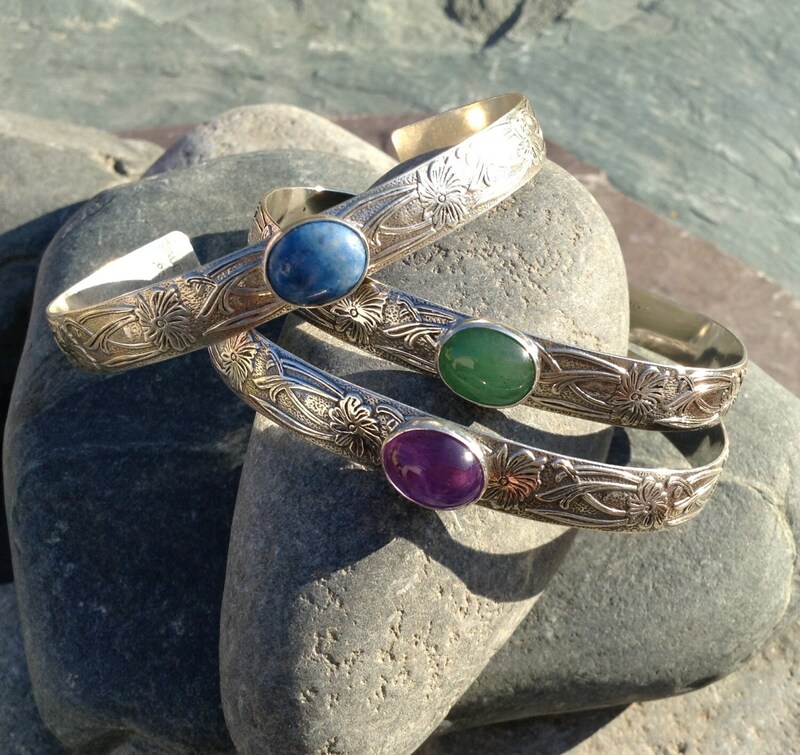 Sterling silver cuff bracelet with an 8X10mm gemstone (shown with denim lapis, aventurine and amethyst). This light weight bracelet is easy to wear daily. Measures 5.5 inches in length and is just under 1/4 inch in width. The opening is about 1.5 inches and can expand or contract. Adjusts to fit many wrists. If a person is an XS or XL please let me know so that I can make the bracelet itself a bit smaller or bigger. The buyer may choose to have a custom message inscribed onto the inside of the cuff. Two of the top sellers at my booth at art festivals are "she believed she could, so she did" and "surround this woman with love and light". Brides LOVE to customize these bracelets for bridesmaids gifts! Create a mother and baby gift! This bracelet is also a lovely complimentary gift to buy with the baby blessing bracelet also listed on my site. This is a beautiful bracelet that I purchased with a garnet stone. I love the floral engraving on the outside and the choice of saying I requested for the inside. Definitely a beautiful gift for yourself or someone else. I ordered two of these with custom quotes for Christmas gifts. The floral design is really lovely and delicate and the font choices are terrific. The perfect "thoughtful gift."